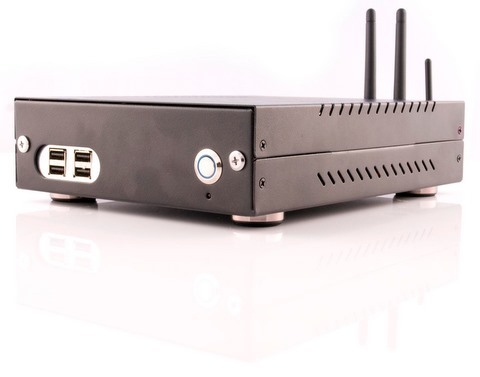 While there are plenty of choices in small form factor computing, Aleutia’s T2 fanless Atom PC is a strong choice. In addition to being able to be configured to have no moving parts, this computer has a low-power dual core Atom processor, VESA wall mount support, Wake-On-LAN capability, auto-booting after power loss, and 12V DC power input. If you need a machine that can handle 720P video but can also work in environments where power may be temperamental, this is the machine for you. 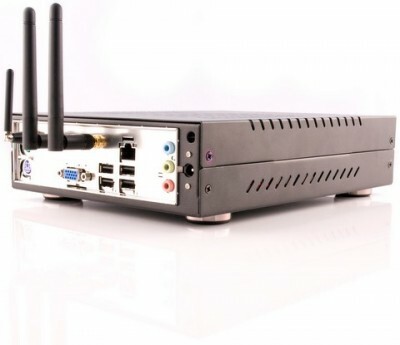 Like most low power small form factor computers, the Aleutia T2 dual core Atom PC is fanless. In addition to drastically reducing noise pollution, this cuts down on energy consumption. Despite this, the T2 is extremely capable. The dual core Atom Pine Trail processor powering it is able to handle most tasks you throw at it, while a dedicated section of the chip will decode and play 720P HD video. Included in the frame of the computer is a VESA mounting bracket. This allows you to, if you wish, to use standard VESA mounts to attach the computer to the back of a monitor, flatscreen or to a wall. This support is in line with the rugged design of the computer. The case is made of galvanized steel, making it perfect for use in rough working environments, or just where it is likely to be banged around. The Aleutia T2 is powered by 12V DC. Unlike most other computers, this machine can be powered off of a car battery without an inverter. Coupling that with its low energy demands, and it is clear that this machine is designed to be used where power is unstable. The machine also turns on when power is applied to it, so you don’t need to worry about reaching it to turn it on. Also, if you need to reboot it, you can use the Wake-On-LAN protocol to turn it on. The T2 seems to fit no role better than that of a carputer. Many people love having a full-fledged computer in their car on which they can store their music collection and videos. You can even use it as a powerful navigation system, if you choose to. Unlike most other options, the 12V DC allows you to wire the machine directly to your battery, while its auto booting after power loss means that you never need to touch the computer. If you need a flexible, rugged computer, the Aleutia T2 is a great choice. Its quietness and low power consumption makes it perfect for an always-on computer, while its Wake-On-LAN and auto booting after power loss mean that it can be tucked away.Whether you want a carputer or a media center, this could be the machine for you. I think there is a spelling error in the company name. Oops, yep, there definitely was. Thanks! So how do you turn off this PC if it’s in car boot for example? Does it turn off when power is disconnected? If so then I would imagine there is a bit of power to let it do this? I personally would have a remote switch near the front of the car. Or, with the right software setup, you could log in over wifi and turn it off from an iPhone. Shawn has a point there, if I use it as a carputer, the last thing I want is to have to switch it off before I switch off my car, I want to be able to switch off the car and not care about the carputer. On the other hand, what about the power consumption? I can not find any figure in your review. Other questions are the OS? boot time (important for a carputer). I suggest checking out the manufacturer for further details. These articles are only summaries. how does this compare to acer’s revo? In what way? Size, power, performance?